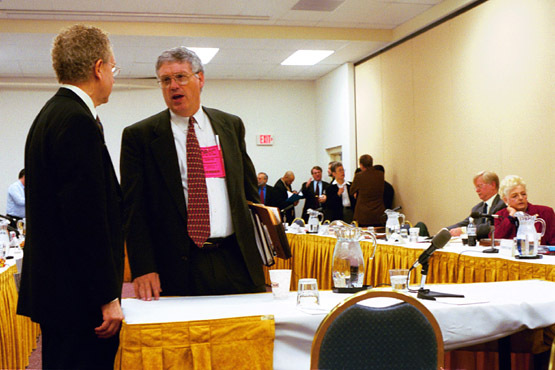 Washington, DC – The full Democratic National Committee approved the party's 2004 delegate selection rules on Jan. 19, 2002 at its winter meeting in Washington, DC. DNC Rules and Bylaws Committee co-chair Carol Khare said the rules reflect Terry McAuliffe's "determination to produce a delegate selection plan that will give us a winning nominee." Party spokeswoman Maria Cardona said the 2004 rules will "give our state parties a level playing field with the Republicans." While critics have suggested the Democratic rules will encourage further frontloading, Cardona stated that, "We are not encouraging any state parties to move up." 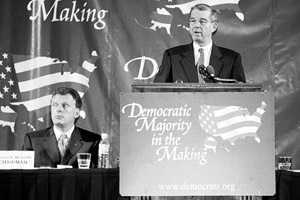 Before the full DNC approved the rules, however, the Rules and Bylaws Committee, meeting on Jan. 18, 2002, heard from two party members opposed to them and held further discussion. Chuck Ross, national committeman from Vermont, urged the Rules and Bylaws Committee to reconsider the rules so that "voices of Democrats from smaller states" are not diminished. Mark Brewer, committee member and chair of the Michigan Democratic Party, proposed an amendment, seconded by Ohio Democratic Party chair David Leland, to end the "unfair monopoly" of Iowa and New Hampshire. Brewer argued that the special privileges granted the two states "violate the very charter of our party." "Tradition in a democracy must yield to fairness and equal treatment," Brewer said. John Willis, committee member and Maryland Secretary of State, noted for the record that the National Association of Secretaries of State's proposal for a rotating regional primary remains an option for the future. However, Harold Ickes, captured the sense of the committee when he said any proposals for change were "coming very late in the game" and that "people want to get this settled." 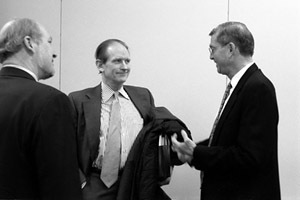 Rules and Bylaws Committee member John Willis and Joe Carmichael talk after the Jan. 18 meeting. 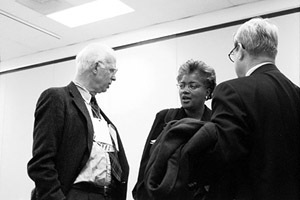 Committee member Donna Brazile talks with David Broder of the Washington Post and Carl Leubsdorf of the Dallas Morning News. Committee members Harold Ickes and Don Fowler talk as political writer Rhodes Cook listens in. The debate over the 2004 rules was not done yet, however. During the DNC general session on Jan. 19, Sen. Carl Levin (D-MI) made a spirited case against the exemptions for Iowa and New Hampshire. "No states should have greater access to our candidates than any other state," Levin said, calling for "elimination of this perpetual privilege." 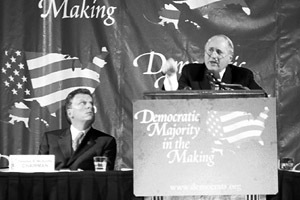 Levin suggested that in 2004 a state should hold its primary the same day as New Hampshire in order to challenge the rules, but he noted that Michigan had backed off from such a move in 2000 for fear of jeopardizing its seating at the convention. He also suggested taking the issue before the convention. Opposing this view, former DNC chair Don Fowler urged support of the Rules and Bylaws Committee report, outlining some of this history and rationale behind the rules. The full DNC rejected the proposed amendment and approved the report. The Democrats' move prompted some sharply unfavorable editorial comment. The Los Angeles Times termed the plan "Primarily, a Bad Idea." The New York Times (Jan. 6, 2002) proclaimed that, "The nation is moving toward the worst possible scenario -- one big, diffuse presidential primary held in the dead of winter, where only the candidates with large amounts of ready cash need apply." USA Today columnist Walter Shapiro (Jan. 16, 2002) opined, "The real losers under the Democrats' new calendar are not the candidates but the electorate."